IS THIS WHAT IT'S LIKE TO HAVE HAIR MADE OF STRAW? Utilizing 12 layers of top tier quality filtration including alkaline ceramics, calcium sulfate, and activated charcoal, we'v e created a water filtration kit that brings your shower water back to the purity your looking for! Our set includes 2 12-layer filters, a gorgeous chrome housing, and all the installation hardware you need to get the shower experience you deserve! Say goodbye to that "there's still mung on my skin" feeling after your showers, and enjoy what a true clean feels like! By removing impurities from you water, we can even help reduce dandruff, dry flaky skin, and can help with your eczema and psoriasis! Our filters even remove scuzzy odors caused by water impurities like sulfur. We love our customers, and know that our company would be kaput without you. That's why we'll always go out of our way to ensure your satisfaction. All you have to do is let us know what the problem is, and we'll do whatever we can to fix it. CLICK "ADD TO CART" TODAY AND ENJOY A CLEAN SHOWER THAT YOU'LL HAPPILY GET PRUNY FOR. NEXT LEVEL PURIFICATION- Utilizing an effective 12 step process, our remarkable shower filter helps to remove heavy metals and sediments from your water, balancing your waters PH levels and giving you a truly gleaming clean! Better still, by utilizing calcium sulfate, our filtration system works no matter what the temperature of the water, unlike other filters on the market. Say goodbye to hard water and enjoy the Juicy Contour shower experience! CLEANER SKIN AND SOFTER HAIR - Do you suffer from dry skin or coarse hair? Your water may be the problem. Our water takes on loads of sediments, bacteria, fungi, heavy metals, and other unsavory characters as it makes it's way to your shower, and by removing those pesky impurities, you can help improve your hair and scalp, giving you more radiant skin and silky soft hair. ONE SIZE FITS ALL - Our shower filtration kit fits any and all showerheads with a universal fit design. 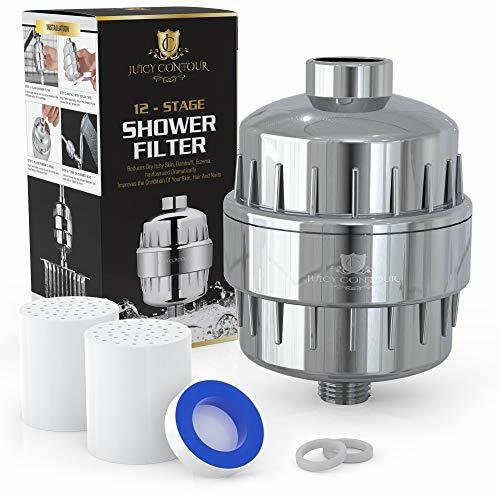 Simply place the filter pack behind your current shower nozzle, and you are well on your way to enjoying softer water, stronger hair, vibrant skin, and even sturdier nails! What's more, our system includes TWO filters for your convenience. From hand held and overhead showers, to gentle rain and traditional wall mounted nozzles, we've got you covered! NO LOSS OF WATER PRESSSURE!- Even when the water is pressed through twelve layers of purification, our extraordinary blend of protection won't slow down your water pressure! The only thing you'll notice is how smooth and light your skin and hair feel. No muss, and no fuss; just pure, unadulterated water time after time. SATISFACTION GUARANTEED - We know that buying anything online can be stressful. What if it's not what I expected? What if I don't like it? With Juicy Contour, you don't have to worry. We offer a full SATISFACTION GUARANTEE on every shower filter we sell. If, for any reason, you are not satisfied with your purchase, all you have to do is let us know, and we'll do whatever we can to ensure your buying experience was a good one. If you have any questions about this product by Juicy Contour, contact us by completing and submitting the form below. If you are looking for a specif part number, please include it with your message.